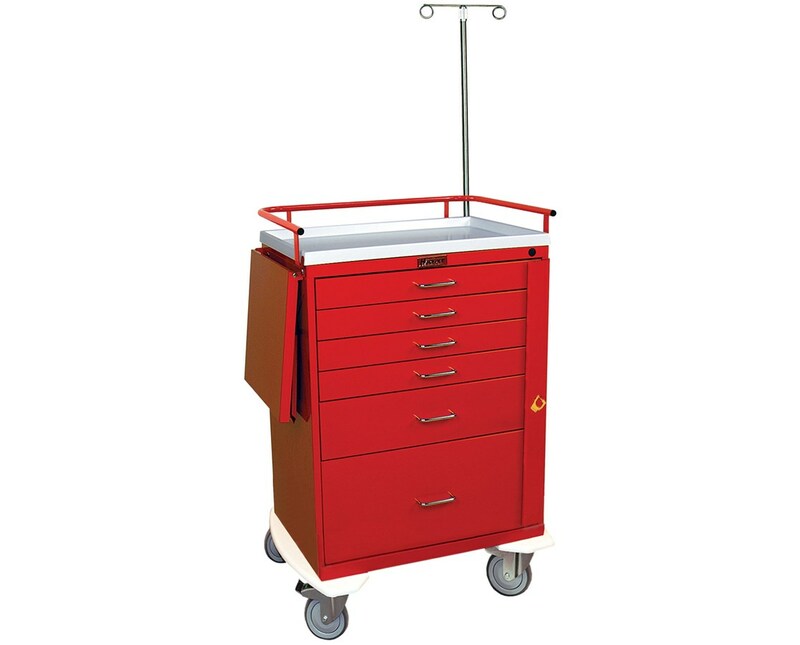 Harloff's Classic Five Drawer Emergency Cart with Bottom Compartment is designed for the long product lifespan at an affordable level. Its sturdy, uni-body steel construction and durable, hard-baked powder coat finish makes for an incredibly strong and reliable cart - and with a 12 year warranty standard, you know it'll be the least of your worries. Versatility is a significant feature of this cart, with a cabinet and drawer design that allows for customized drawer configurations, 30" of vertical drawer space and a removable plastic top. Included are 4 3" drawers, 1 6" drawers and 1 12" storage compartment with a flip-up door. The strength of the cart doesn't stop at the uni-body steel construction or powder coat finish. With a stainless steel break-away lock bar, stainless steel top rail/push handle and 5" ball-bearing premium casters (all full swivel - one tracking, one braking), this is a emergency cart that can truly handle emergencies. The full wrap-around bumper on a separate stabilizing frame tops the package off nicely. 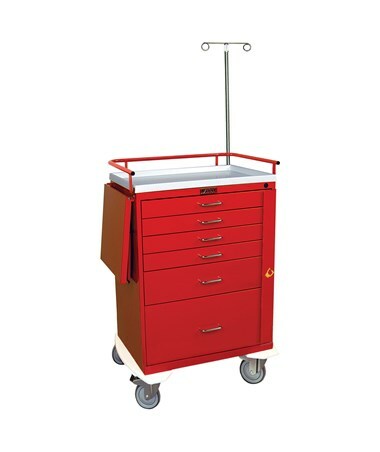 The included accessories add dramatic functionality to this crash cart. Everything from a cardiac board and brackets to a drop shelf to an oxygen tank holder ensure that you are ready for any situation. Other great features include pre-drilled threaded holes for side-mounted accessories, an included pack of 100 break-away seals, latex-free construction and 16 available color choices (View Chart). The cart is delivered fully assembled. Full wrap-around vinyl bumper on separate steel frame that is designed to enclose and protect all included accessories such as the suction unit shelf, etc.